If you’re new to Austin, you’re probably searching for a few key stores or service providers like a great grocery store, a good pharmacy, and the best residential cleanings services in Austin, TX. Surely finding the best “local dry cleaners near me” is on the top of your list! If this fits your description and you’re wondering, “Where are the closest dry cleaners from my location?” or even “Are there any dry cleaners open on Sunday near me?”, you’re in luck! Ecoclean has many locations in the area so it is easy to find the nearest dry cleaners in Austin, TX! And better yet, we have been consistently rated The Best of Austin by readers of The Austin Chronicle. You can be sure your experience at your nearest cleaners will be great if it flies our EcoClean banner. Ecoclean is one of Austin’s favorite dry cleaners because we care. We care about our customers. We care about quality. And last, but not least, we care about the environment. Ecoclean uses an environmentally friendly wet cleaning process that works for almost all “dry clean only” items. Unlike average dry cleaners in your area, Ecoclean’s wet cleaning process is non-toxic and doesn’t use chemicals that are hard on your clothes. 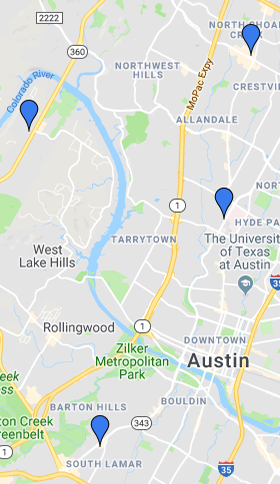 Cost conscious customers may also be wondering, “Where can I find the best dry cleaners prices near me in Austin?” Just pop over to our website or download our app to find the closest Ecoclean near you. Not only are our prices great, but we also offer free pickup and delivery. All of our delivery customers also receive a Green Garmento bag for free instead of regular plastic dry cleaning bag. Your Green Garmento bag serves as a hanging hamper for dirty clothes on their way to our wet cleaning facilities as well as a cover for your clothes once they are clean and on their way back to you. Don’t worry! We wash all environmentally friendly Green Garmento bags free of charge for all pickup and delivery customers! If you’re still wondering, “How do I find laundry and dry cleaning near me?” or “Are there any dry cleaners near me open today?” pop over to your nearest Ecoclean. Chances are we have a conveniently located professional cleaning facility near you!